CARSTAR announced it has received the Cystic Fibrosis Foundation’s national Rising Star Award. The Rising Star award is given annually to a corporate supporter who has demonstrated increased or expanded participation and fundraising efforts for cystic fibrosis (CF) in the year. This award was established in 2010 and, over the course of the past eight years, the Cystic Fibrosis Foundation has recognized companies like UNUM Insurance, Bank of America, CISCO Systems, Inc., ARRIS Communications and now CARSTAR. 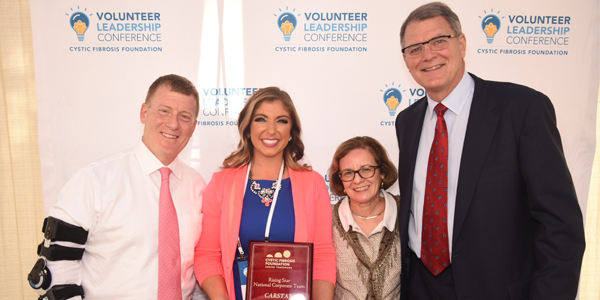 CARSTAR received the award at the Cystic Fibrosis Foundation’s 2019 Volunteer Leadership Conference. A longstanding Driven Brands leader and CARSTAR champion, Hannah Ross, senior marketing director for CARSTAR, accepted the award on behalf of CARSTAR and its franchise partners across the U.S.
“My experience at the Cystic Fibrosis Foundation’s 2019 Volunteer Leadership Conference was one of the most rewarding experiences of both my personal and professional life,” said Ross. “It was so empowering hearing the stories of those affected by CF and being around other likeminded companies who are passionate about this cause. Our Canadian counterparts have been fundraising for this cause for over 20 years, and the more our U.S. franchise partners and corporate leaders get involved, the more we understand why.